Who lives in California! Raise your hands..(Pretend I can see that hand up) . Our weather is nuts! It’s 100 degrees one day and the next its 68 (which is super cold for us, haha). So I went to Long Beach to visit my lovely friend Ramona who I have known for about 5 years now. She has a fashion blog to so when we are together we love taking pictures of each other and chatting about our future plans for our blogs and we also love to eat … A LOT! So, when I went there we planned on going to the ocean for some blog photos and the weather was absolutely perfect. 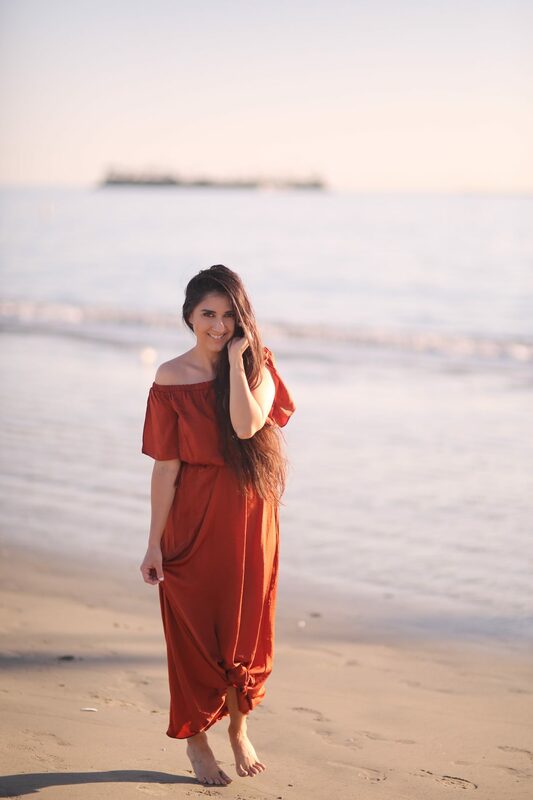 Who would have thought…walking barefoot on the sand by the ocean in december wearing a silk dress. Loved it. Hope you enjoyed my little chit chat with you here , you can find outfit details below as always and see you in the next post! I will be sure to update you once it’s available but I also posted dresses somewhat similar below for you. Cute ones that I am tempted to buy 😉 I got you!